The Los Angeles Maritime Institute serves to empower youth to discover their greater potential through extraordinary at-sea experiences. We envision a thriving community where every young person can look to the future with confidence. Founded in 1992, Los Angeles Maritime Institute (LAMI) serves disadvantaged youth throughout Southern California with transformational experiences at sea. Our “learning by doing” program is a proven Adventure Education concept that brings classroom learning to life and exposes young people to a world beyond their communities. Since our founding, we have served over 60,000 young people age 13-19 and changed the course for thousands of disenfranchised youth who were on a dropout path leading to gangs, drugs and crime. Our highly interactive at-sea program takes place aboard the twin brigantines, Irving Johnson and Exy Johnson. These 110-foot traditionally rigged vessels were named after experiential learning pioneers who sailed around the world seven times with young crews in the '30s and '50s, with a short hiatus as a result of World War II. 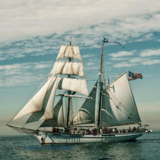 Our vessels were built at the LA Waterfront (in San Pedro) between 2000 and 2002 and at their launch, proclaimed the "Official Tall Ships and Maritime Ambassadors of Los Angeles" by City Council resolution. They are the only twin brigantines in the world. Recognizing the extraordinary value of "hands on" learning, TopSail founder, sailor and retired science teacher Jim Gladson designed an innovative program that incorporated every aspect of operating a large sailing vessel to engage youth in the "fun" of learning. In addition to bringing subjects like science and math to life, the shipboard environment challenges youth to work together, improves communication, stimulates critical thinking and provides a safe environment to address feelings of inadequacy. Add to this the sheer joy of being on the water, the experience is enlightening and empowering to say the least. TopSail historically targets middle school youth who are on a dropout path, but is available to high school students and upper elementary grades as well. The program ranges from a single day sail in our local waters to a multi-day voyage to the Channel Islands where each day’s learning builds upon the previous day. We focus on Title I schools and low-income communities in Los Angeles and Orange counties. We are solely dependent on donations to keep our “learning by doing” program afloat. The Los Angeles Maritime Institute is a 501(c)(3) nonprofit organization. Our Federal Tax ID number is: 33-0515416.